Aircel free Internet For All – Hello Friends , Hope You All Are Good And Enjoying Our Free Recharge Tricks By Tricksstore. I Regularly Provide Amazon Quiz And Answers And Win Prices . Here is the new plan for Aircel Users for unlimited internet data. Every one wants to defeat Jio free internet service, And with it we all are getting super benefit day by day because of this free internet battle. We are seeing every day Airtel, Idea, Vodafone and others companies daily comes with their exiting offers, And now Aircel come up with free internet data for all. In which you will get Free unlimited internet data up to 500 MB in the morning from 3 AM to 5 AM. We know this Aircel unlimited internet plan will going viral. 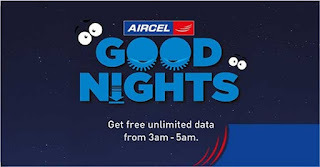 Aircel named this free internet plan as Aircel Good Night Plan , Where they are giving unlimited data in Good Night Plan which is limited up to 500 MB. This is big loot and best thing is that you don’t need to pay anything for that. Every Aircel User can get Benefit of this Free Internet Aircel Offer. So, Hurry up guys go for it. 1. First of all Do any Data Plan Recharge in Aircel Sim. 2. As Simple as, Aircel Good Night plan will be activated Automatically. 3. The validity of This Unlimited Aircel Good Night Plan will be same as Your Data Plan. For example – If your current data plan is for 30 Days, You will get 3 AM to 5 AM Unlimited Data for 30 Days. 4. Your data speed will be decreased to 123 Kbps On After you excess the limit of 500 MB. Offer and the Aircel bill payment rules. Aircel in relation to Offer shall be final and binding upon Eligible Subscriber. * No correspondence shall be entertained with regard to the Offer. vendors and members of their immediate family will not be eligible to participate in the Offer. any of their designated nominee(s) due to participation into this Offer. him/her, is true, current and complete. * Eligible Subscriber shall be subject to the Courts having jurisdiction in Gurgaon (Haryana). consequential arising out of the Offer. India or any other statutory authority from time to time. tampers with or who in any way abuses the process or Terms and Conditions of the Offer.